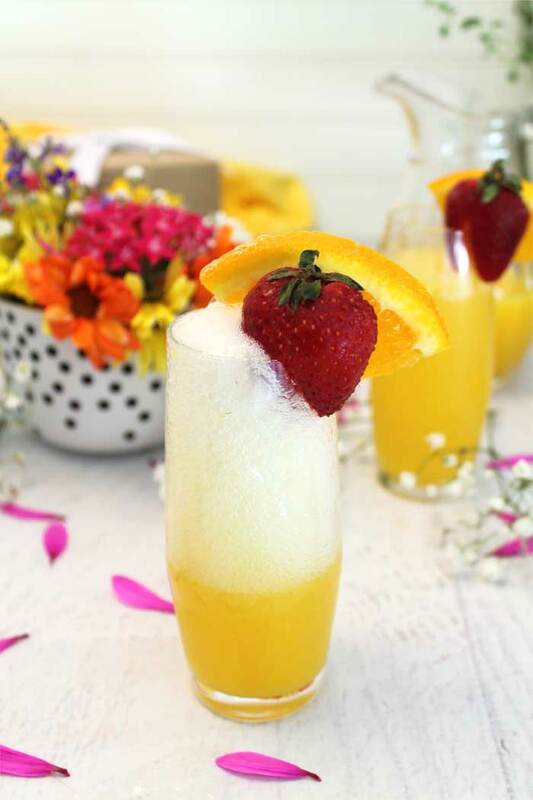 These Sparkling Mimosas are not only delicious but super easy to make too. Just 2 ingredients, fresh orange juice & champagne, make this incredibly refreshing cocktail. It’s the perfect drink for any holiday celebrations from Mother’s Day to Christmas, graduation to anniversary. Cheers! Mother’s Day is just around the corner and time to show mom just how much she means to you. She’s been there for you with all her love & support, guiding, nurturing and helping you to become the best you can be. My mom was certainly all that and more and I miss her dearly. We always celebrated the day with a big brunch, French Toast, Eggs Benedict, Almond Danish (her favorite), fruit and, of course, mimosas. 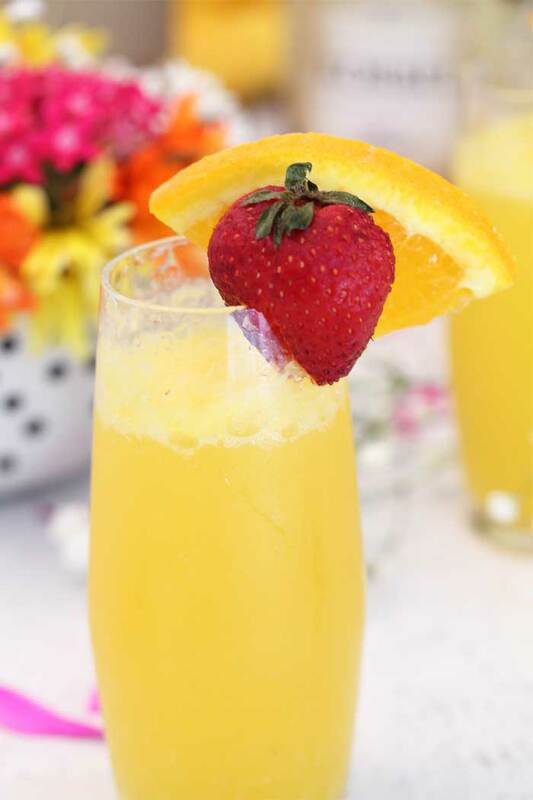 Mimosas are one of the easiest cocktails to make, containing just 2 ingredients, making them flavorful and light, perfect for a morning cocktail hour. All you need are champagne flutes or prosecco glasses, I bought the ones shown here and love them. Get the freshest orange juice you can find, as the main flavor in this cocktail is the orange juice, as it will make all the difference in the world. 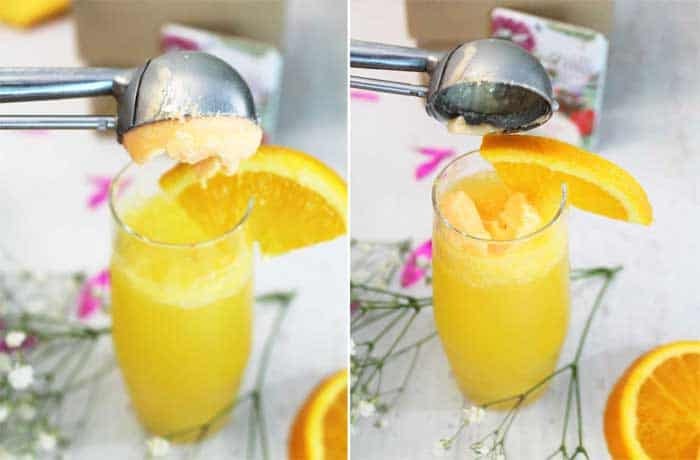 Pour the flute 1/3 full of orange juice then top with champagne, sparkling wine or prosecco. And just a note, you can go with an inexpensive sparkling wine or prosecco, sticking with something that costs between $10-$20, and it will be just as delicious. 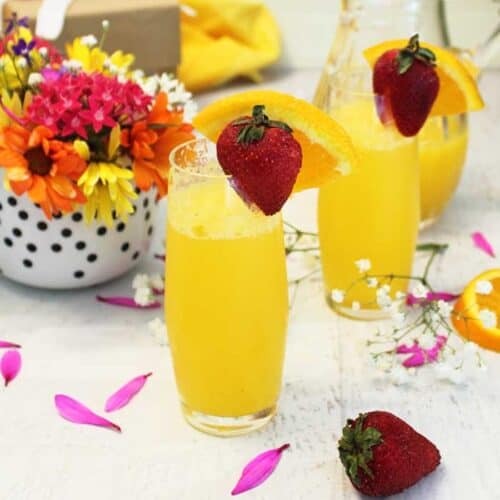 These sparkling mimosas are great for other special occasions too, like Christmas, New Years, graduation, anniversaries and weddings. 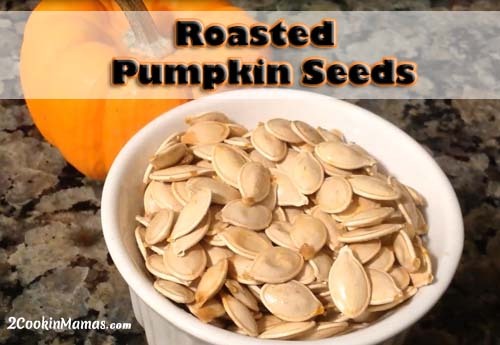 And since they’re so light, it’s the perfect summertime cocktail. I always imagine myself sitting in a villa overlooking the ocean and sipping on a mimosa. Well, we can dream, right? Want to change it up a bit? 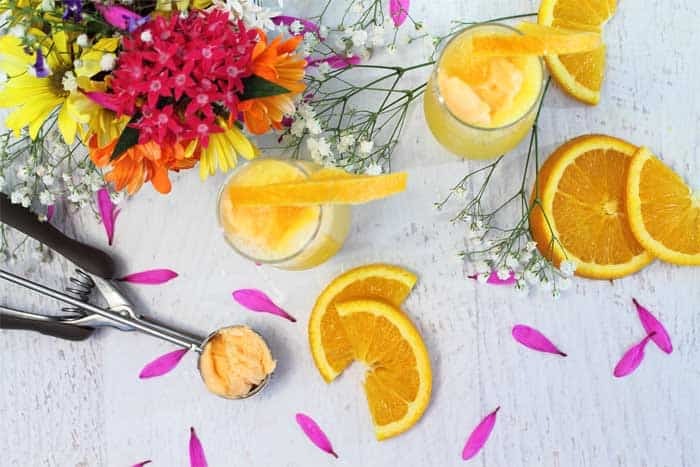 Make a DIY mimosa bar with different add-ons for guests to make their own. Besides the champagne and orange juice, have a few liqueurs available such as Chambord, Peach Schnapps and Grand Marnier. Add in some juices like cranberry and pomegranate, bowls of berries, and an ice bath with a small container of orange sherbet and a small cookie scoop. I love topping mine with orange sherbet but I bet lemon would be awesome too! 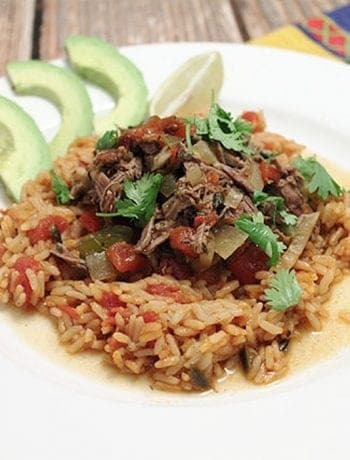 Looking for more ideas like this? Check out our tried and tested Cranberry Mimosas, Sparkling Pomegranate Cocktail and our all occasion Valentine Wine Spritzer. 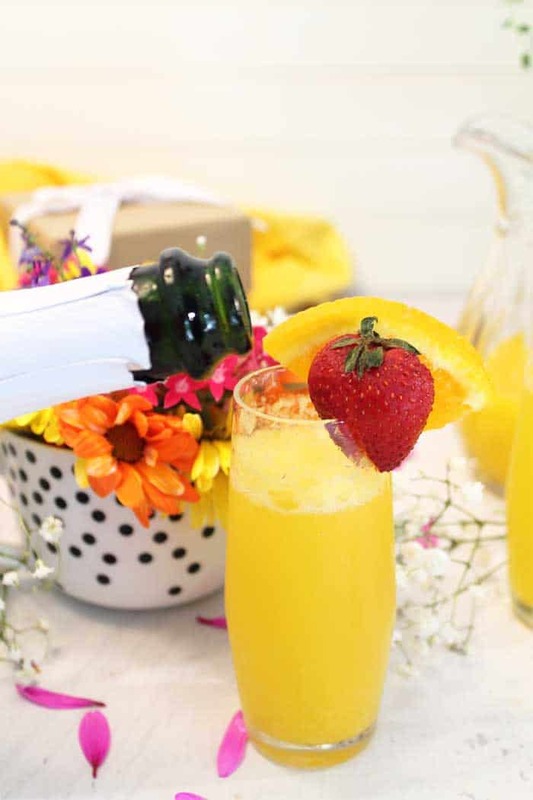 These Sparkling Mimosas are not only delicious but super easy to make too. Just 2 ingredients, fresh orange juice & champagne, make this incredibly refreshing cocktail. It's the perfect drink for any holiday celebrations from Mother's Day to Christmas, graduation to anniversary. Cheers! 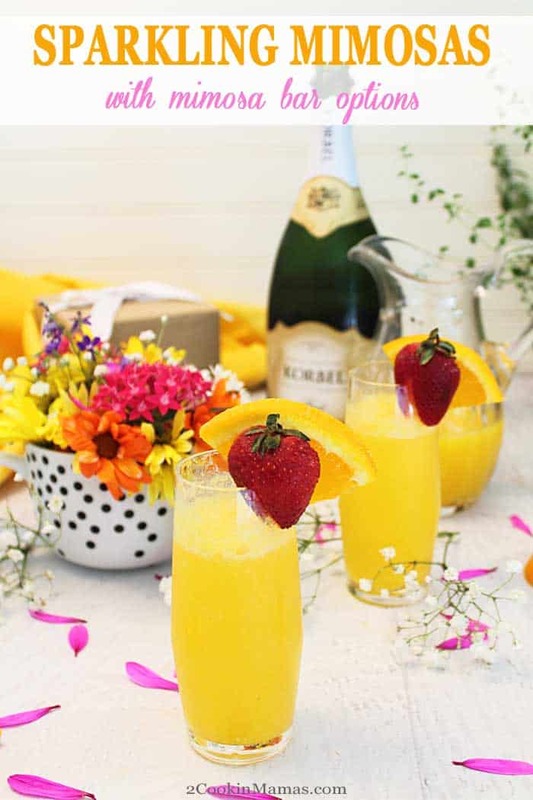 Pour orange juice into champagne flutes or prosecco glasses. Slowly pour champagne in flutes until full. If adding a small scoop of orange sherbet or splash of Grand Marnier or Chambord, do so now. Serve immediately with a strawberry and/or orange slice on the rim. Love cocktails? 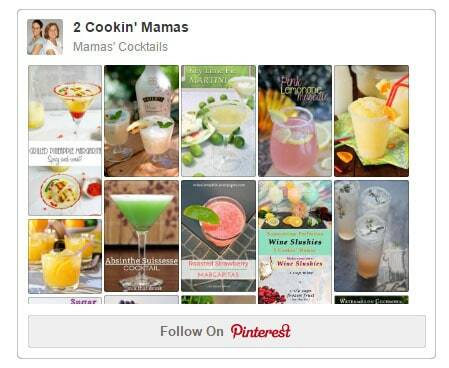 Follow along on our “Mamas Cocktails” board for tons of delicious drinks perfect for your next 5 o’clock somewhere hour. Sounds so refreshing with the ice cream and it looks amazing delicious! Thanks Terri! It’s become our go-to when celebrating a special occasion. And it tastes so good! 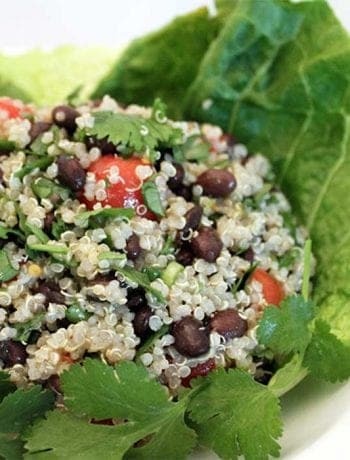 This is the PERFECT way to celebrate a special occasion! Love this with a scoop of sherbert! We love to celebrate this way! I didn’t know how good it was going to be when I dropped that sherbet into the glass but it won the whole family over.